YESIL, A. , OZENLI, D. , ARSLAN, E. , KACAR, F.
In this paper, a new noise minimization approach is proposed for CMOS current-mode (CM) circuits whose input stage is differential. This is realized by focusing on input stage and some output stage transistors' transconductance. Effect of output stage over the noise model depends on output stage's operation. This minimization is introduced to designers as a trade-off between design parameters and noise reduction. Analyses are presented in basis of Differential Difference Current Conveyor (DDCC) for simplicity. To reinforce theoretical concept, simulation results are given both in schematic and layout based. Moreover, a DDCC filter application, which has single input and four outputs is presented to verify theoretical minimization approach. After minimization, it is shown that significant noise reduction is obtained up to 50%. In addition, Monte Carlo analysis is given in order to investigate process variations and temperature effects on measured input referred noise. E. Bruun, "Analysis of the Noise Characteristics of CMOS Current Conveyors", Analog Integr. Circuits Signal Process., vol. 12 pp. 71-78, 1997. T. M. Hassan, S. A. Mahmoud, "New CMOS DVCC Realization and Applications to Instrumentation Amplifier and Active-RC Filters," AEU - Int. J. Electron. Commun., vol. 641, pp. 47-55, 2010. E. Yuce, "Voltage-Mode Multifunction Filters Employing a Single DVCC and Grounded Capacitors," IEEE Trans. Instrum. Meas., vol. 58, pp. 2216-2221, 2009. H. P. Chen, "High-Input Impedance Voltage-Mode Multifunction Filter with Four Grounded Components and Only Two Plus-Type DDCCs," Act. Passiv. Electron. Components, pp. 1-5, 2010. E. Bruun, "Noise Properties of CMOS Current Conveyors," In 1996 IEEE International Symposium on Circuits and Systems. Circuits and Systems Connecting the World. ISCAS 96, 1, pp. 144-147, 1996. G. Ferri, N. C. Guerrini, "Noise Determination in Differential Pair-Based Second Generation Current Conveyors," Analog Integr. Circuits Signal Process., vol. 41, pp. 35-46, 2004. G. Palmisano, G. Palumbo, S. Pennisi, "CMOS Current Amplifiers", vol. 499, Springer Science & Business Media, 1999. G. Ferri, N. C. Guerrini, "Low-Voltage Low-Power CMOS Current Conveyors," Springer Science & Business Media, 2003. W. Chiu, S. I. Liu, H. W. Tsao, J. J. Chen, "CMOS Differential Difference Current Conveyors and Their Applications," IEE Proceedings-Circuits, Devices and Systems, vol. 143, pp. 91-96. 1996. 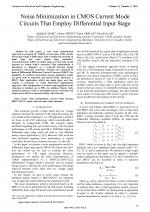 W. Y. Chiu, J. W. Horng, "Voltage-Mode Highpass, Bandpass, Lowpass and Notch Biquadratic Filters Using Single DDCC," Radioengineering, vol. 21, pp. 297-303, 2012. S. Maheshwari, "Analogue Signal Processing Applications Using a New Circuit Topology," IET circuits, devices & systems, vol. 3, pp. 106-115, 2009. 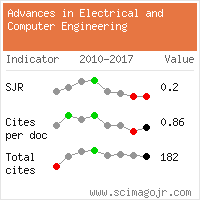 T. Tsukutani, Y. Sumi, N. Yabuki, "Novel Current-Mode Biquadratic Circuit Using Only Plus Type DO-DVCCs and Grounded Passive Components," International Journal of Electronics, vol. 94, pp. 1137-1146, 2007. M. A. Ibrahim, S. Minaei, E. Yuce, et al. "Lossy/lossless Floating/Grounded Inductance Simulation Using One DDCC," Radioengineering, vol. 21, pp. 3-10, 2012. E. Yuce, "New Low Component Count Floating Inductor Simulators Consisting of a Single DDCC," Analog Integrated Circuits and Signal Processing, vol. 58, pp. 61-66, 2009. U. Torteanchai, M. Kumngern, K. Dejhan, "A CMOS Log-Antilog Current Multiplier/Divider Circuit Using DDCC," TENCON IEEE Region 10 Conference, pp. 634-637, 2011. B. Razavi, "Design of Analog CMOS Integrated Circuits", McGraw-Hill Series in Electrical and Computer Engineering, 2000. J. W. Horng, "High Input Impedance Voltage-Mode Universal Biquadratic Filter with Three Inputs Using DDCCs," Circuits, Syst. Signal Process., vol. 27, pp. 553-562, 2008. Citations for references updated on 2019-04-22 11:27 in 132 seconds. Website conception, design and maintenance by Eugen COCA. Content updated on 28 Feb 2019. Site engine updated on 28 Feb 2019. This page was generated on the server in 0.069 seconds and loaded in your browser in > seconds.